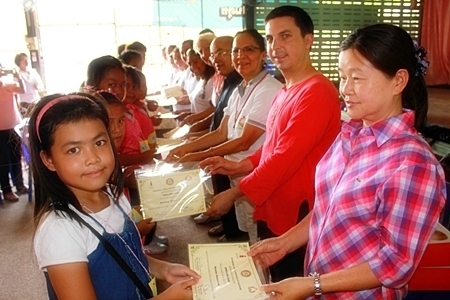 Students attend the closing day to receive certificates of accomplishment at the summer camp. Grandma Cares Partnership Program (GCPP) concluded its first Annual Summer English Camp with 89 students receiving certifications. Certifications were earned by attendance and participation. At no cost to them, over 100 students attended the Monday through Wednesday morning lessons from March 13th to April 25th at Ban Mae Yoi, Ban Lukpan, and Sai Moon Schools. The principals of these three rural schools partnered with GCPP to support their students to be successful in their English learning, which is part of the 2015 ASEAN integration. With huge support from the international volunteers from Payap University, the children learned English through reading, writing, playing games, and much laughter. 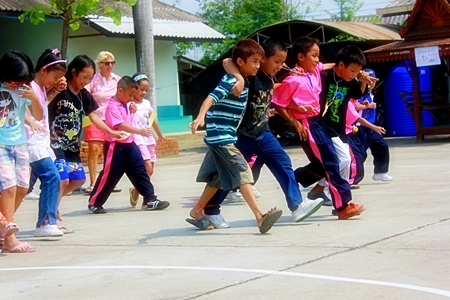 Games were the main feature for their graduation held on April 27th at Sai Moon School. After the 9:00 introductions, the students were paired for a 3 legged race that was followed by a ping pong race. Both ended with much laughter! For the next hour, the students moved through six different stations where they played such games as earthball, bowling, and chalk jumping. Mask painting was also one of the fun activities. The closing ceremony had a student representative from each school to share their thoughts and feelings about attending the English Camp. The volunteers also shared and this was followed with the handing out of 89 Certificates of English Completion along with prizes for excellent attendance. A group photo was taken and then lunch was served to end the exciting day. kids enjoyed the last day of camp. of completion on the final day. 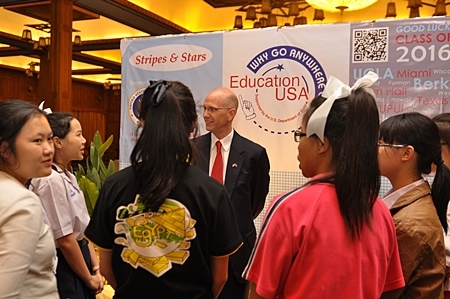 U.S. Consul General Kenneth L. Foster met with families and students who attended the gala evening on May 18, 2012. 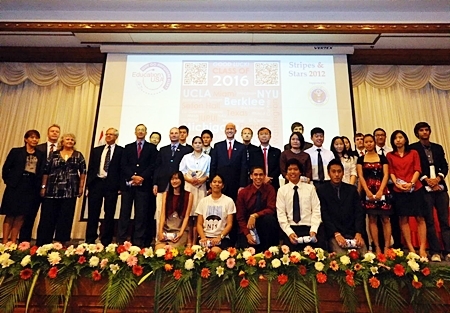 With support from the U.S. Embassy, Bangkok, Team Ace (the EducationUSA advising center for northern Thailand) hosted over 200 guests for “Stripes & Stars 2012: A Gala Salute for Students from Thailand to the U.S.A.” on May 18, 2012. The students, families and advisors joined Consul General Ken Foster for a group photo. A finger dipped to check for balance, an extra sprig of coriander added to the pot, an additional minute or two left to simmer are just a few culinary decisions made by twelve new “Young Chefs” as part of Prem boarding students’ new cooking discovery program. Tomato and coriander soup was the dish of the day, and proved to be a tasty introduction into the world and art of cooking! 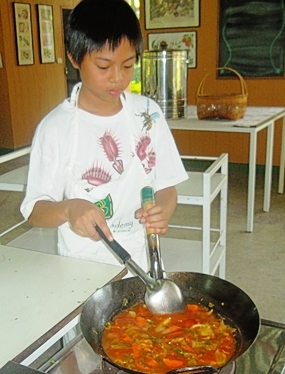 A “young chef” stirs his creation. Unlike the popular competitive television series “Young Master Chef”, cameras, intimidating panels of judges, tears or disappointment will not be found at our “Young Chefs” cooking pavilion. Created by boarding parent, food aficionado and cookbook author, David Buck, the program is similar to the television show, but with a twist. It is not a competition, but rather a course in culinary discovery designed to be fun and experimental, open to all boarders from Grades 4-12. Starting in Term 4, the program will run over three consecutive terms with eager chefs learning the ins and outs of cooking safety and hygiene; fruits, vegetable, herb and meat preparation; identifying textures, aromas and tastes that combine to create diverse dishes and the art of food presentation. With a culturally diverse group of participants from Korea, Bhutan, Thailand, England, Australia and Nepal, David hopes over the months to inspire the art of fusion cuisine: blending the culinary traditions of two or more nations to create and discover innovative and sometimes quite interesting dishes. The grand finale will come at Christmas time when the young chefs, instead of simply reproducing an old family favourite, an internet recipe or something copied from a cookbook, will create their very own three course menu created from fresh local produce. Their creations will come from their own experiences during the previous months’ trials, experimentation, new-found knowledge and risk of discovery! Their respective dishes will be conceived on taste, creativity and presentation. All participants are winners with their final creations to be published together in the first edition of Prem’s very own cookbook. Cooking classes are held every other Saturday for ninety minutes – two hours. Instructors David Buck and Three-Generation Cooking Academy’s very own, Khun Nae, are presenting the class at the Cooking Academy Pavilion. “Young Chef” balances stirring the student's excitement with encouragement, aims to raise standards and develop culinary talent, introduces new dishes and local produce and celebrates Prem's distinctive gastronomic appeal amongst its young boarders. The Royal Rajapruek Park will be honoring National Tree Day by planting trees all week at the park, students and the public are invited to join in the event which will plant Rajapruek trees in the park and surrounding areas. The Park will also distribute seeds and seedlings including rubber trees and other trees to park goers and interested farmers. Activities will be held from June 1-10 to increase awareness and education on environmental issues. 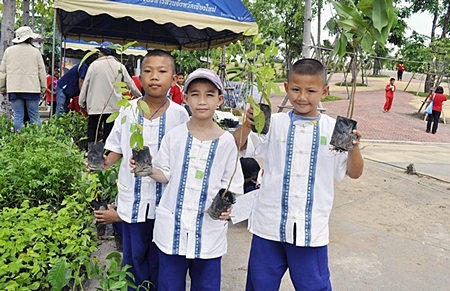 The Park will plant 8,599 Ratchaphruek Trees to honor HM the King on his 85th birthday. National Tree Day is held on Visakha Bucha Day which occurs on June 4 this year. Art Relief International Volunteers man the booth at the exhibit opening at 2nd Floor Gallery on May 4, 2012. 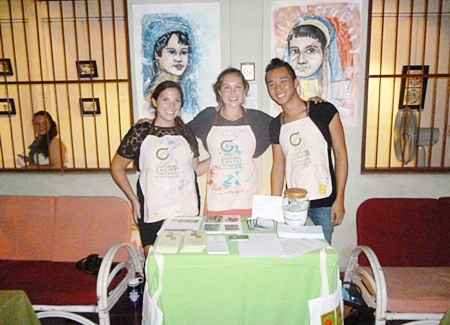 Art Relief International, a program which works to help struggling social groups transform their lives through art, put on an exhibit of art created by disadvantaged children through their Young Lions Global Art Program. The exhibit, titled “The Playing Field” featured the art works of children as young as 3 and 5 years old and reminds all of us adults of the very unique view of the world children have. The art isn’t as childish as one might think given the ages and is often quite thought provoking. The exhibit runs through the end of May and all works are for sale with proceeds benefitting the ongoing work with the children. The show is located at the 2nd Floor Gallery at the Ratwithi and Ratchapakinai Rd intersection. Closed Sundays. 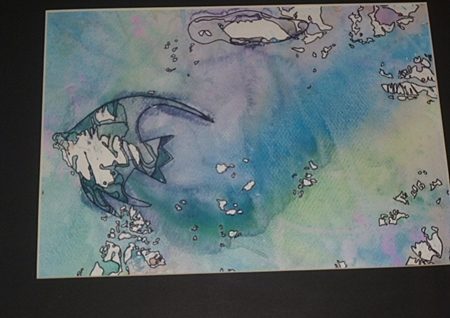 This beautiful watercolor was created by one of the children in the program. 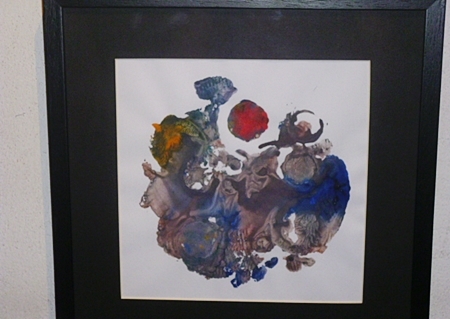 This piece represents the planets and the stars, done by a 5 year old it caused a lot of discussion as many people saw different things in it. 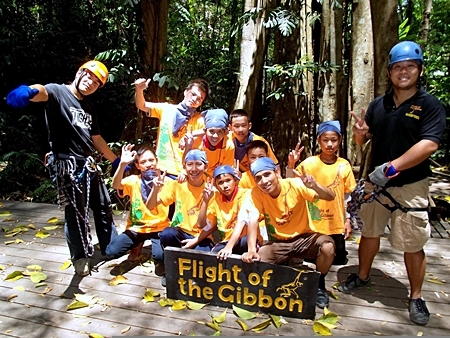 Wat Don Chan kids get the thrill of a lifetime at Flight of the Gibbons. 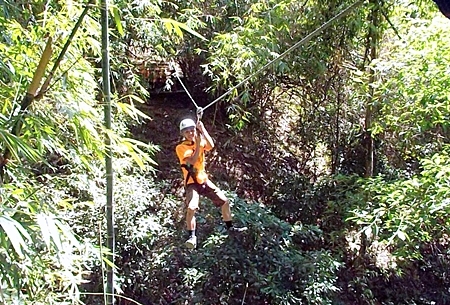 This intrepid kid was happy to glide along the zipline alone at the day out at the Flight of the Gibbons on May 1, 2012. 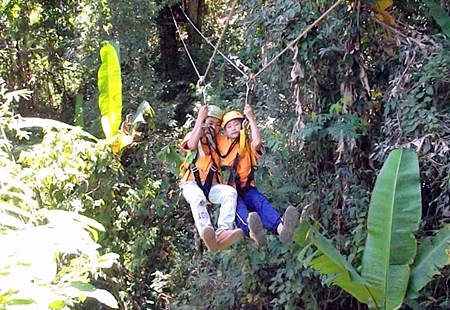 50 kids a day from Wat Don Chan school will visit one of Chiang Mai’s most exciting attractions, Flight of the Gibbons for 3 days this week to take part in the thrill of ziplining. The added bonus for these youngsters is, as they zip and trek through the jungle they will learn about nature and the importance of conserving the environment. In addition to a morning at Flight of the Gibbons, they kids get lunch, a trip to bathe in the waterfall in the hot afternoon and a souvenir t-shirt. For most of these kids, this kind of trip is beyond their imagining and the delight on their faces as they strapped in was more than apparent. 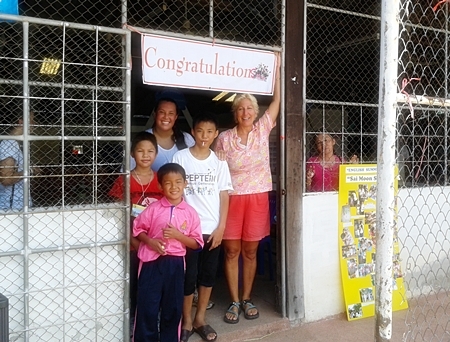 Flight of the Gibbons regularly hosts underprivileged kids from the city schools to visit the camp. Looks like the teachers had as much fun as the kids ziplining. These two went together, sometimes it feels safer in numbers! Kids from Wat Don Chan are joined by Tim McGuire at the Flight of the Gibbons on the first of three days out for children from the school. 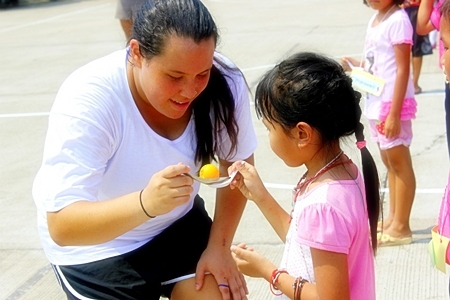 PTIS is holding a brand new Global Issues Camp this summer. This experiential learning experience is perfect for students with an interest in current world events, who take part in the model United Nation or just want to see a different side of Thailand. 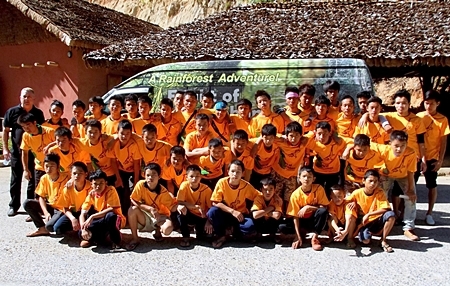 The camp is presented by Three-Generation Camps located on the campus of the Traidhos Community (http://threegeneration.org) and Prem Tinsulanonda International School. Here young learners will discover, explore and investigate a whole range of global issues from poverty and HIV, to sustainability and elephant conservation, to the opium trade and organic farming. Throughout the camp students will develop skills in research and enquiry, have the opportunity to take part in structured debates to help highlight the complexities of these issues and become culturally aware global citizens. Students will achieve this through practical community service, meeting staff and clients from NGOs, visiting small communities and talking to local people. Students will also get the chance to feed and bath elephants, cook pizza in an earthen oven on the farm, visit beautiful temples, milk goats, shop in the busy night bazaar, eat traditional northern Thai food, swim in the swimming pool and much, much more! The camp will run from the 16-24 June, 2012.